Get a head start with a credit card tailored for students and recent graduates. From cash back on good grades to discounts on streaming services, you can find the perfect card for college life. Our editors analyzed 109 credit card offers for students to bring you our recommendations - here are the best student credit cards from our partners to kick off the school year. The best student credit cards help young adults build credit, learn good spending habits, and even reap rewards for good grades in college. Many major credit card issuers, like Chase, Citi, Discover, and Capital One, offer cards specially designed for students with little to no credit history. Use a student credit card responsibly, and you’ll be on your way to building a foundation of solid credit before you graduate. Find the perfect student credit card for you by exploring top offers. Note that there are federal restrictions on issuing credit cards to individuals under 21. What should you do with your credit card when you graduate? Learn more about building your credit as a college student! Our experts at CreditCards.com analyzed 109 student credit card offers to find our top recommendations. 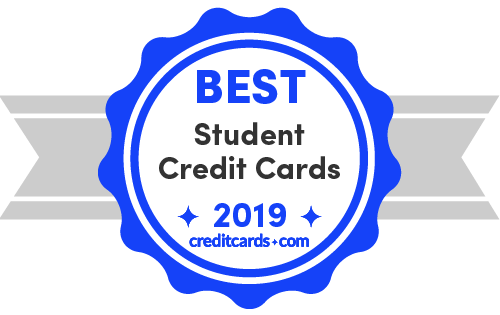 Below are our picks for the 5 best student credit cards of 2019. The Discover it Student Cash Back tops our list as the best credit card for students because of its rewards rates and special perks. Credit needed: Chances are, if you are a student, your credit history is quite limited, if it exists at all. Therefore, we limited our picks to cards where you have decent approval odds, even without an established credit history or high credit score. No annual fee: We stipulated that only products with a $0 annual fee could count themselves among the best student cards. As a student, the last thing you need is to be saddled with additional expenses. No foreign transaction fee: In the same vein, you want to make sure you're not incurring extra costs during your spring break or semester abroad. This is where a card with no foreign transaction fees comes in handy. Intro bonus offer: Only a handful of student credit cards come with a substantial intro bonus. These bonuses can put a substantial amount of money back in your wallet, which is one reason why Discover's cards (with their cashback match intro offer) take our top 2 spots. Rewards: Students deserve to be rewarded for their card use as much as anyone else. Ideally, these rewards will be in relevant categories but even a flat 1% back on purchases can add up over time. Student-specific benefits: Again, there are good credit cards and good credit cards for students. Thoughtful perks like free Amazon Prime Student membership or extra rewards for good grades set great student credit cards apart from any regular card. The Discover it Student Cash Back offers much of the same terms as its chrome variant, including no annual fee and good grades rewards. While the good grade reward feature and APR values match those of the Discover it Student chrome, the cash back does function differently with this card. With the Discover it Student Cash Back, you can enroll every quarter to earn 5% cash back on rotating categories (up to $1,500 in purchases per quarter). You'll also earn unlimited 1% cash back on everything else. Note that unlike the chrome, the regular Discover it Student Cash Back has rotating categories and does require enrollment each quarter. But, it also offers a higher rate of 5% cash back (on up to $1,500 quarterly) on those categories. And, don't forget the great Discover feature of automatically matching your cash back at the end of your first year. When asked to pick the best credit card for students, our experts were torn between these two cards. The reality is they are both superb credit cards, especially for cash back; so the decision will come down to your personal spending preferences. A cousin of the Discover it Student Cash Back, the Discover it Student chrome offers many of the same features and perks: no annual fee, no APR changes for late payments, and "good grades rewards." While those first two features shouldn't be taken for granted, a reward for good grades is definitely one of the more intriguing – and unique – perks among credit cards. Specifically, the Discover it chrome gives you a $20 statement credit for every year you finish with a 3.0 GPA or better, up to 5 years. Where the Discover it Student chrome differs from its non-chrome variant is in how its cash back works. Whereas the regular Discover it Student Cash Back lets you earn cash back on categories that rotate each quarter, the chrome has a flat cash back rate with fixed categories: 2% at gas stations and restaurants (on up to $1,000 combined per quarter), and 1% on everything else (unlimited). But it's the cash back at year-end that makes the Discover products unique. Discover will match your cash back at the end of your first year automatically. The Journey Student Rewards card from Capital One provides all of the solid basic features you'd expect from a credit card for students, and also adds on some desirable perks to boot. One of the most important reasons to get a credit card as a student is to build up your credit, and the Journey offers access to a credit line increase after paying on time for your first 5 monthly bills. Paying on time is also made easier by the fact that you are allowed to choose your own monthly due date. Additionally, the card earns you 1% cash back on all purchases – this cash back rate actually goes up to 1.25% if you pay on time, a nice incentive for young cardholders to build good financial habits. It also comes with no annual fee, no foreign transaction fee, and even fraud coverage in the event your card is lost or stolen. With its flexibility, lack of fees, and solid cash back offering, the Journey Student Rewards from Capital One makes for a worthy first credit card in any student's wallet. A new addition to the Citi suite of cards, the Rewards+ Student Card is a great option for college students. It features a sign-up bonus of 2,500 points (redeemable for a $25 gift card) after you spend $500 in purchases within your first 3 months of account opening. More notably, it lets you earn 2X points per dollar spent at supermarkets and gas stations—common expenses for many college students—on up to $6,000 in purchases per year. After that it's 1X point per dollar spent, which is also the rewards earned on all other purchases. While the sign-up bonus may seem somewhat paltry, it is decent for a student card. Plus, the Rewards+ Student Card is still a strong option for daily purchases due to its solid 2X rewards categories. You're also able to earn 10% points back when you redeem, on up to 100,000 points per year. All of this makes it a solid option, considering it has no annual fee. The Deserve Edu Mastercard is another great option to help build your credit history while earning unlimited 1% cash back. Like our other top picks, it comes with no annual fee, helping keep money in your pockets for tuition and ramen purchases. It also offers some benefits that are hard to come by – for instance, a $49 credit for your Amazon Prime Student membership. As part of the Mastercard network, the Deserve Edu student card provides its fair share of perks, including no foreign transaction fees, price protection, travel assistance, extended warranty, and ID theft protection. Perhaps most surprisingly, it offers a credit line of up to $5,000 which is quite high among student credit cards, even as an upper limit. Adulting is hard. Don't make it harder than it has to be. Pay your bills on time. Don't take out more student loans than you have to. And for heaven's sake, get a credit card and take care of it. Here, we look at some pretty good reasons for getting a credit card. The easiest and fastest way to build credit is with a credit card. You can do it other ways, such as on-time payments of a student loan, but scoring models particularly love it when you use a credit card properly. Within a few months, you can build your credit, getting you ready to buy that sweet, sweet ride, to rent your dream apartment or even to take out a mortgage. Want to bypass getting a card? Know that you may delay building your credit to the best score you could otherwise get. It's a good idea to have a credit card to practice on. With a student card, you can get in the habit of paying in full and on time each month, getting your score closer to your goal with each month. Also, you can practice using rewards, building your points or cash back with every purchase. Finally, by having a credit card, you can get in the habit of simply using it each month, whether for a gym membership, at restaurants or each time you get gas – because, remember, you want to make sure you keep the account active, so that your good credit habits are showing up on your credit reports. One of the best reasons for getting a credit card is for the convenience. Rather than getting loaded down with a heavy wallet or bulky purse, sometimes it's nice to just have your keys, card and driver license. Just think – you can pay at the pump, at Starbucks or through the drive-thru in a flash. While there are a few occasions when cash is needed, credit cards are a favorite when it comes to ease of use, particularly when shopping online. Many student credit card accounts can eventually be upgraded, pending good credit history. If you behave responsibly, you can get an increase in your credit limit, or even have a secured account transferred to an unsecured account, meaning your deposit is refunded or put toward your balance. Have plans to get season tickets to show your support for the basketball team that you wouldn't be able to buy otherwise? Don't. Just don't. Here are some times when you SHOULDN'T take out a card. Don't transfer some loans to your card. While balance transfer cards will typically allow you to transfer a non-card loan, there are some cases when it's a bad idea. For example, a low-interest student or car loan is best staying where it is. Don't take out a card without a budget. Better yet, make sure you have the funds before you make any purchases. The best way to do this is with a budget that tracks what you will put on your card. That way, at the end of the month, there are no surprises. When you’re ready to get your first credit card, do your homework. Check your credit reports, find your credit score, and research cards that fit your needs. There are a number of student credit cards available, most with unique features and conditions. Take special notice of annual fees, rewards offered, and APRs. Narrow your selection and apply to only one card. Every time you apply for a credit card (this is called a “hard pull”), it’s noted on your credit report. Multiple applications can negatively impact your credit score and make it more difficult to get approved for a card. All credit cards share similar properties, but especially in the case of student credit cards, specific features can vary greatly. For example, 9 of 10 cards surveyed offer a rewards program; 6 offer cash back; 2 offer point rewards; and one offers travel rewards. Take the time to discover the conditions your card carries and you will be in a better position to take full advantage of your credit. APR — The annual percentage rate is the interest you will be charged on balances carried from month to month. If you pay your credit card balance in full every month, you won’t be charged interest. Credit limit – The credit limit is the maximum dollar amount you can charge in any billing period (typically a month). For most student credit cards, the limit is $1,000 or less. If you pay your bills on time, card issuers may increase your limit. Rewards — Many credit cards, student cards included, offer rewards to the user. Rewards include cash back, points, and sign-up bonuses. Cash back is simply a percentage of the charges you make credited back to your account. Rewards points can usually be redeemed for gift cards, electronics, and other prizes. Consider your spending habits and make sure to apply for the card that offers you rewards that are most relevant to you. Can you have more than one credit card as a student? It's not uncommon for college students to stick with their first credit card for a while until they've built up their credit scores. However, opening additional credit cards is an option if you are a responsible cardholder. "As long as students are comfortable with credit cards and avoid overspending, it's fine to get more cards," says CreditCards.com industry analyst Ted Rossman. Annual fees. Though most student credit cards do not have annual fees, many rewards cards typically do. This fee is usually $50-$500. Cash advance fees. Users can pull cash from their credit card, usually with an extremely high APR. Beyond traditional fees, there are penalty APRs that come into effect when minimum payments are not met for three consecutive months. Penalty APRs are usually the highest interest rates credit card holders will experience. Also, note that failing to pay off your balance can negatively affect your credit score and rack up interest charges and potentially late fees. Let's say you use a credit card that carries a 24.99% variable APR. If you spend $300 in the first month and choose to pay off your balance on time, you will pay a total of $300. If you fail to pay on time, your balance will accumulate interest. Next month, before paying the minimum payment, your balance will be $306.25 ($300 + $6.25 interest). With a few easy steps, you can ensure that you take wise care of your new card, all while building your credit and enjoying the convenience of having a card. We also look at what to avoid when using a card. Yes, you may have a $1,000 credit limit, but you can eat that up quickly with a weekend trip or a few nights' entertainment. But it's important to make sure you don't go over your credit limit, because it can trigger a fee, although some, such as the Deserve Edu, don't charge an over limit fee. One of the things scoring models track is how much available credit you have. The more the better. The best way to keep your balance low is to pay your card bill in full each month. As you can see, you'll pay almost half of the balance in interest charges if you just pay the minimum. But if you pay more than the minimum, you can decrease the amount of time it takes you to pay, as well as lower the amount in interest charges. Pay in full? No interest charges. Pay several times a month. Because you don't know when the card issuer will send your information to the credit bureaus, there is the risk that you will not have paid off a high charge yet, even though you pay in full before the due date. The trick around this is to pay in full 2-3 times a month. That way your credit utilization ratio stays low. Your credit utilization ratio is the amount you owe by the available credit you have. So if you have $1,000 in available credit, and you owe $100, your ratio is 10%. Anthony Sprauve, spokesman for myFICO.com, says people with scores of 750 and above use an average of 7% of their available credit. Although those with higher credit scores tend to have higher credit limits, it is still an important lesson to learn. Sprauve says:, "If people stay somewhere between 10 and 20 percent range, that's a good place to be." By utilizing less of your credit limit, you're indicating that although you use credit, you're not overly reliant on it. Pay late, and you can end up paying a late fee and even eventually getting your account closed. Add to that, every late payment goes on your credit report and stays there for 7 years. The easiest thing to do is to simply pay on time each and every time. Make sure you use your card. Don't get lulled into bad advice and put your card in your sock drawer. If you want to build your credit, you have to use the card. Why? Because the card issuer might close the account for lack of use. If you're worried about going over budget, use your card for a single purchase each month, such as a recurring bill, and put it on auto debit. Just make sure the bill is paid each month. Don't forget about your card. Whether it's paying on time or using it each month, make sure you stay mindful that you actually have a card. Use monthly reminders, put it on your calendar – anything that will help you remember to use it and pay it. Don't lend your card to someone. If you lend your card, know that you are responsible for any charges they make. The card issuer won't consider it theft if you gave the person access to your card. Your best bet? Just don't lend it out in the first place. With the possible exception of rent and automobiles, you can put pretty much anything on your credit card. The question is: Should you? You'll need to make sure there are no fees that make a charge a mistake that comes back to haunt you. When you study abroad or have upcoming Spring Break plans to travel overseas, you want to make sure you won't be paying any foreign transaction fees. Some card issuers, such as Discover, offer their cards with no foreign transaction fees, which can otherwise run 3% on all purchases that go through a foreign bank. Some colleges and universities allow you to pay with a credit card without charging a convenience fee, but you'll need to check, because these fees can be a percentage of the total charge. A convenience fee of say, 3%, is tacked on to your bill, and that can add up. If the charge for your semester is $5,000, then count on paying $150 just for the honor of using your card. Also, make sure that you have enough available credit to put the tuition on your card. Gas and Restaurants: Driving home for winter break? With the Discover it Student chrome, you can earn 2% back at gas stations and restaurants (up to $1,000 in combined purchases per quarter). Textbooks: With registration for the spring semester coming up, it's time to think about getting textbooks, and there's no better place than Amazon.com. With the Discover it Student Cash Back, earn 5% back on Amazon purchases the last quarter of 2018 up to $1,500 each time you activate, then another 5% back at the end of your first year. Meal plan or groceries: The Journey Student Rewards from Capital One rewards you with 1% back on all purchases, which becomes 1.25% when you pay on time that month, perfect for groceries, meal plans and other expenses. Discover's bonus category for Q1 2019 is also grocery stores. So, rather than whipping out that debit card, think about how to use your student credit card. More than two-thirds of students said they weren't confident that they could pay off the debt they acquired in school, according to Trellis Company, and almost half say they have run out of money at least 3 times in the last year. That means the first thing you need to do when striking out on your own is learning how to budget. In a nutshell, write down everything you spent in the last month, no exceptions. Then, add something for savings, even if it's $50. Once you add everything, pare back if you need to in order to match your incoming funds with your outgoing, although you want to save a little something for fun or you won't stick to the plan. Keep in mind that there are myriad things we forget to budget for. If you use a credit card, build those expenditures into your budget, marking them as card spending, but making sure they are part of the bottom line. There are some excellent tools out there for helping you manage your budget, if you are so inclined. Building credit is pretty much the same for all consumers, but there are a couple of extra hoops for a consumer under 21. That's because the Credit CARD Act of 2009 put in place protections designed to make sure predatory lenders don't take advantage of unsuspecting young adults. Bottom line: While you can get a card of your own in theory when you turn 18, you'll need your own income, no matter how small, until you are 21. As with all adult consumers, you'll want to pay your bills on time, get a credit card as soon as you are able and keep your card debt low. Some 43.5% of students reported that they did not have a credit card and 32% only had one card, according to Ohio State's National Student Financial Wellness Study from 2015. If you are favoring your debit card because of fear of a credit card, you might want to rethink that strategy. Building credit is easier with a credit card, and you can earn points or cash back with every café latte you purchase. One card is enough to help you build your credit. If you are under 21, as you know, there are limitations in place, but there are some ways your parents can help. The easiest way and fastest way to build credit is with a credit card, but that can be a tough nut to crack for consumers under 21 years old. Luckily, there's a way to help your student improve her credit relatively easily – make her an authorized user. When she is removed from your card, the card drops off of her credit files, which means your good habits are no longer there. That's why she needs to get a card of her own when she can. Make sure the card issuer will report to all three major credit bureaus for her credit files. Some don't. If you don't make sure of this, then her credit may not benefit. Ensure that you have good credit and keep paying your bills on time, so that she benefits. The authorized user doesn't have to be 18, which means you could give your underage teen a card, depending on the card issuer. Student cards are typically unsecured, which means no security deposit is required, the credit limit is usually lower, and the average APR on student cards is 17.20%. If your student has some independent income, then a secured card might be a good choice. In some cases they have rewards and even no annual fee. Ideally, you want a student card with no annual fee that isn't secured (such as the Discover it Student Cash Back), but a secured card is a good Plan B. Have her track her spending and tell you when it reaches a certain amount during the month. If it's her card, help her set up alerts so that she knows when she's approaching her monthly limit. Give her a limit for emergencies, and make sure she tells you immediately when they occur. With her own card, she needs to make sure she has a place in her budget for emergencies so the card isn't a crutch. Make her responsible for her spending. Set up a system in which she pays you the same time every month, like a bill. With her own card, help her set up a monthly reminder to pay the card on time. Teach her to pay in full each month, so that she's building good credit habits. Show her how to check her credit score and credit reports regularly, either through creditcards.com or with MyFICO.com and AnnualCreditReport.com. A friend or roommate may at some point ask your student to co-sign for them on a card or loan, particularly if she has independent income. The simple answer: Don't do it. Co-signing makes her equally responsible for the bills, even if it's the friend's car. Even if there's no falling out between them, your student can easily lose track of whether the payments are being made on time and only get the bad news after the account has gone in arrears. Also, it's very difficult to be removed from an account as a co-signer, unlike an authorized user. While it's unlikely she would be asked to co-sign for a card, because few if any card issuers accept co-signers, she might be asked to be on the hook for a car or personal loan. Sit down with her and show her – on a spreadsheet, an app, whatever – how you manage your budget each month. Make sure she understands that this is a monthly affair, not a one-time endeavor. Be sure to give her tips about how to track her card spending so that she doesn't do the "spending shuffle" and make purchases without a care in the world. What should you do with your student credit card when you graduate? While some student cards have features special to college students, for the most part they offer the same features as other credit cards, including rewards and the ability to build credit. If you are preparing to graduate in May, you'll likely want to think through your credit and credit card. Should you add a card? Maybe lose the card you have? And what do these actions do to your credit? Here's what we have to say about that. Should I get rid of my credit card? Unless you have an annual fee, there is pretty much no reason to get rid of the credit card, and even then you want to make sure there are no benefits to counterbalance getting rid of the card. But you don't have to live with things the way they are. Can I get a credit limit increase? The biggest change you might want to make is to get the credit limit increased. Here's how: Once you start your new job out of college, contact the card issuer, and just ask. With your new salary, you should get a sizeable increase, which helps with your available credit if you have a balance. Here's another tip: Check with your card issuer and see if you qualify for an upgrade that will allow you to keep your credit history. You might be able to graduate from a 1% back card to a 1.5% back card, for example. Just make sure it's an upgrade and not a new account, so that your history continues to grow. Also, there should be no hard inquiry if it's an upgrade. Should I add a credit card? With all the cards available today, you can build points and cash back, earning for spending every day. You can apply for a card that rewards you for airline or hotel loyalty. Look at our best credit cards to see if there is one that suits you. But if the sole purpose of having a credit card is to build credit, one is enough provided you pay in full and on time each month.